Did you see my latest video on YouTube? 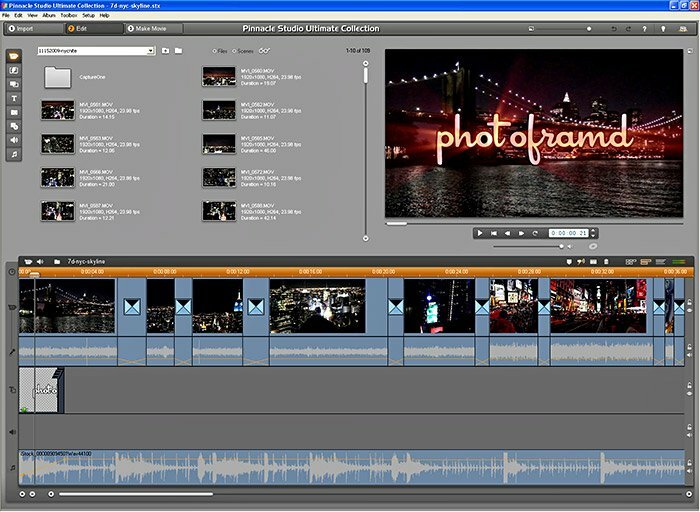 New York City Lights marks my 10th Canon 7D video edited with Pinnacle’s Studio HD and I could not be happier. The above screen capture gives you an idea of the workspace for the video. Over 3 night’s of video edited down and mixed using transitional blends. A separate audio track is used for the music overlay. 1. Video is not as forgiving as shooting RAW. If the exposure is off, you are stuck. The LCD display is very accurate for video, so pay attention BEFORE you start filming. 2. If you need to set the ISO, Exposure and Shutter Speed, the 7D’s Manual setting is your only option to full control. But, for the most part, the camera is smart enough with video to leave the camera in P (Program mode) allowing you to lighten or darken the photos using the Exposure Compensation +/- settings. 3. Focus in Camera Mode and then switch to Video Mode. The Camera Mode has access to all of the 19 AF Points while Video Mode only has the Center-weight focus. 4. If you want to use a zoom effect, you need to have a sharp focus on the end point of the zoom. Zoom in all the way, and focus at that point. Then Zoom out and start filming. 5. Image Stablized Lenses like Canon’s 15mm-55mm IS EFS and 70mm-200mm IS L will stabilize video fairly well. Of course, there are limits. This is no steadicam! Just like in still photos, quality optics will create impressive results in the clarity of the captured video. 6. Even shooting on a tripod can show a slight wobble in the video. Be sure to allow a second or two before and after the desired video capture to allow the camera to settle. 7. For under $30, the SteadePod is very effective at stabilizing both hand-held video and still photography. 8. Use a fast CompactFlash card (like Sandisk Extreme IV 16gb) to keep up with you. I can easily fill a 16gb card in a busy day of shooting RAW stills and video. Did you know there is a website that independently tests the speed of CompactFlash cards? The results are surprising. 9. Shooting video is a constant drain on your battery. Remember to charge it or carry a spare. Using the Battery Grip (BG-E7) more than doubles the battery performance. 10. The typical video clip (before a cut) is between 4-seconds and 10-seconds. Longer clips are possible (up to 12-minutes) but must include a strong subject matter to hold someones attentions (ex. talking, action) Shoot longer and edit down. I purchased this camera about 2 months ago for a month long trek through Thailand. I would recommend picking up a 64gb compact extreme card. I took a 32gb cf card and a 64gb and throught it was plenty. I filmed and shot constantly everyday. Well, that’s putting a lot of data on one card. What happens if the card is lost or corrupted?? I would much rather purchase multiple smaller cards to lessen the impact for a failure. I agree. I purchased the canon 7d early this year and bought a 32g Kingston CF card with it. My first download batch was around 500 photos, but a few were corrupt. It took forEVER to retrieve all my photos. Have you come across an issue where the camera (even in complete manual mode) automatically adjusts exposure in video mode while zooming? I have set everything in manual mode but it still continues to do this. any suggestions? The most common automatic adjustment is the aperture. If you see the scene automatically darkening or the colors suddenly deepening, the Canon 7D just adjusted the aperture. Aside from that, take a look at the ISO setting. Is it set to “A”? It is easy to forget that the 7D can use the ISO speed to compensate for changes in light by slowing or speeding up the ISO by checking the light level before you start shooting. I do not think it can change the ISO while you are shooting video. That really would not make sense. Also, be sure the check out may article on speed ratings of CompactFlash cards here. Actually adjusting the ISO is exactly what the camera does in video mode. Shooting M mode is best for video. Make sure ISO is set to a number not “A.” try and keep your shutter speed below 120. The iris will adjust when you zoom in and out. The lens will have a smaller iris zoomed all the way in. That is why there are two numbers for the minimum f-stop on zoom lenses. Well, what do you know??!! I just confirmed this with Canon. The Canon 7D will adjust ISO while you are filming if set to A. You can verify this yourself by tapping the shutter button (don’t press it half-way otherwise the 7D will “seek” a focus). Regarding corrupt files, the handbook recommends formatting new (and used) cards to avoid corrupt files – possibly you did it but I took my first few photos then read the manual! Personally, I have never had a problem with corrupt files on a CompactFlash card. But, then I never “delete” files on the card and I always re-format the card after each use. And, never format in your card reader – only format the card in the camera itself! However, I have had to help friends who are too lazy to follow those steps and help them recover their lost photos. I am not sure about which problem you are having. You might want to try Canon’s 17-55mm f/2.8 EFS lens. It is Canon’s only f/2.8 wide angle with Image Stabilization. The lens is very sharp and works great with the Canon 7D. It is my standard “video” lens. Any point in holding down the AF-ON during a video shoot? Actually, yes! The AF-On button on the Canon 7D is basically the same as a half-press on the shutter. It triggers the auto-focus (and tracking focus with AI Focus or AI Servo). It also triggers the IS (on a lens with IS). The only thing it does not do is take the photo. This works for both stills and video. By using the shutter button to focus during video, you run the chance of accidentally taking a picture, pausing the video to capture the still and recording the shutter sound. Using the AF-On button avoids that. Keep in mind that you will also record the Canon 7D hunting for focus which will need to be edited out. You can alter the functioning of the AF-On button through the C.Fn IV-1 screen. But, keep in mind – the camera will refocus when you press the shutter button half-way. Through the same C.Fn IV-1 screen you can disable the shutter button from focusing to split the function of focusing and taking the picture. I purchased this camera several months ago and I had to say I am disappointed. I have yet to shoot any video without it being noticeably noisy. I have tried many settings but still the noise is apparent. If I could I would get a refund. Have you compared your videos to the ones in my YouTube Channel? I regularly shoot up to 1600ISO in daylight and 3200ISO at night. If your results are not similar to my then I would suggest first resetting your camera back to factory defaults (Menu > Third Yellow Wrench > Clear all camera settings. While you are there, confirm the your camera is on Firmware 1.2.5. My next question is what lens are you using?? Your lens choice will have a big impact on the quality of the video. Most of my videos are shot with the Canon 17-55mm f.28 IS EF-S. It is the only wide-angle zoom that Canon has with Image Stabilization AND an f/2.8. But don’t be so discouraged. Shooting video with an DSLR is not the most natural thing for a photographer and takes practice. It is definitely an area where you will improve with practice. It’s a matter of learning the camera and its strengths/weaknesses.